IDS-409F3-C2SD40-SD20-XT - Industrial Managed Ethernet Switch - 9 ports: 6 x 10/100/1000Base-T RJ-45 ports and 2 x 100Base-LX, 1310nm single mode port with duplex SC connector [40 km/ 24.9 miles ] and 1 x 100Base-LX, 1310nm single mode port with duplex SC connector [20 km/ 12.4 miles ]. -40 to 75C Industrial extended operating temperature. IDS-409F3-C2SD40-SD20-XT Industrial Managed Switch. 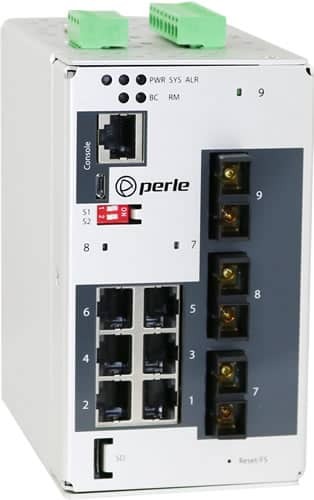 9 ports: 6 x 10/100/1000Base-T Base-T RJ-45 ports and 2 x 100Base-LX, 1310nm single mode port with duplex SC connector [40 km/ 24.9 miles] and 1 x 100Base-LX, 1310nm single mode port with duplex SC connector [20 km/ 12.4 miles]. -40 to 75C Industrial extended operating temperature.